Female Trump Fan Club To Host Mar-A-Lago Gala To Make Up For Charity Exodus Over Nazi Comments - Joe.My.God. President Donald Trump’s fan club is throwing a party in January to celebrate his first year as president — and to support Trump’s Mar-a-Lago, which saw an exodus of private charity events booked for galas this winter season. The Trumpettes will host a Red, White and Blue Celebration for the first anniversary of Trump’s presidency, to be held Jan. 18 in the Grand Ballroom of Mar-a-Lago on Palm Beach, said Toni Holt Kramer, the Trumpette’s founder and an ardent Trump supporter. 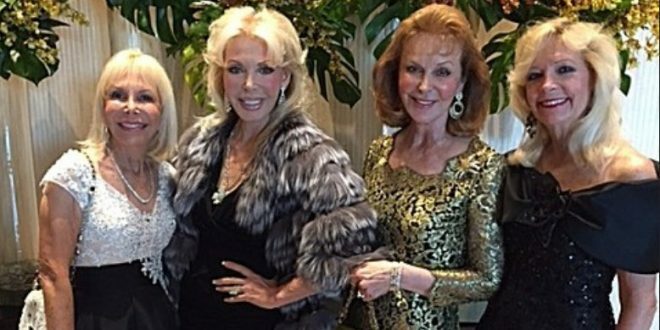 The Trumpettes started as a group of four wealthy and well-connected women seeking to get Trump elected president back in 2015. It has mushroomed into thousands of supporters nationwide and even throughout the world, leading to numerous television appearances and articles about Holt Kramer and her cause. Holt Kramer, a former model and Hollywood reporter, said she came up with the party idea after seeing a parade of charities this summer pulling their winter fundraising events from Mar-a-Lago. The exodus followed Trump’s controversial comments following the neo-Nazi and white supremacist rallies in Charlottesville, Va. in August.